Men, take a seat. 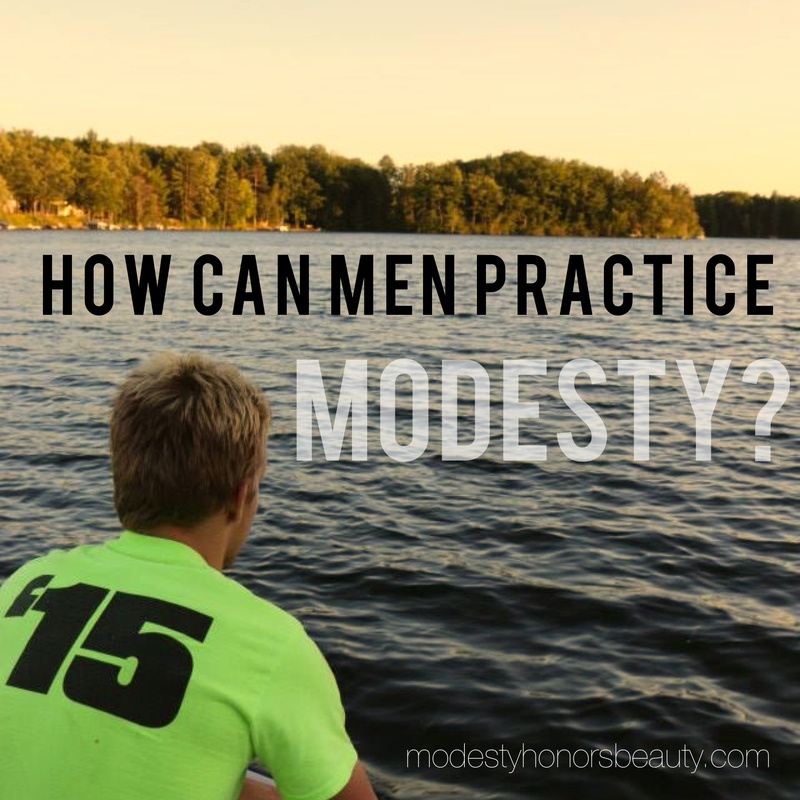 We need to take a few minutes to think about what our role is regarding modesty. We’ve come to believe that modesty is a topic concerning only women, and that has led us to forget what modesty is in the first place. Let me start by telling you what modesty is not. Modesty is not just a decision about what clothes we wear. Modesty is about living our lives in humility for the glory of God and for love of our spouse. Modesty is not about telling women what they ought to wear to fit our personal standard. Women feel confused and ashamed of their bodies because we falsely tell them they should cover themselves because their bodies are sinful. Most importantly, modesty is not about telling females to dress modestly so as to avoid making a man lust. Hearing the argument that men can’t control their desires just makes me cringe. It is a beautiful and natural thing to be attracted to a woman, but when you think of her as an object to be conquered, you are lusting. And, like it or not, men, it’s your fault if you lust after a woman. The assaulter doesn’t get to blame the victim, so as a man doesn’t get to blame a woman for his lustful desires. When we lust, God doesn’t tell the woman to change her clothes, He tells us to pluck out our eye (Matt 5:29). Our failure to properly love women has made them feel like they should have nothing to do with us. This is not how we should make women feel. A woman should feel so loved and respected by our own modest service towards them that they would also want to live modestly out of love for us and God. Women have even begun to despise modesty because men are trying to take control of women’s choices. I unfortunately was one of these men, wrongfully trying to tell a woman she should dress in more “modest” swimwear, and I was making her feel guilty if she didn’t. She wasn’t even dressing immodestly, I just wanted her to know my opinion. Thanks be to God, she spoke out and corrected me as soon as I mentioned it to her, because that is not what a man should do. What a man should do is learn to live a modest lifestyle himself first, because right now we are doing a pretty poor job. Living modestly is about swallowing our pride and accepting God’s call with a servant’s heart, just as Mary did. So, first, let’s talk about what God’s call is. God calls all men to love women as Christ loved the Church. And how did he love the Church? He died for her. That is what we are supposed to do for all women, whether they are mothers, daughters, sisters, girlfriends, or wives. God calls all men to protect, defend, uplift, and serve women because women are seriously awesome. After all, God created woman after man because He was saving the best for last. Woman is the pinnacle of creation. Even our sinful society knows that. Jason Evert had me question why our society sells images of women instead of colorful rainbows. Because women are the most beautiful thing in the world, but our society hates women and has destroyed their nature by dominating them. It is time to protect and serve women, and we do this by living a modest lifestyle. So what does our modesty have to do with responding to God’s call and loving women? In order to love women like Christ did, we must be modest. That means not boasting about our strength, or how good we are at football, or exercising so we can show off our bodies for the ladies. Live for God and not for the people watching. When Christ healed the blind man, we didn’t hear him say, “Oh man, look at how awesome I am for healing you. I am so great.” No. He did it modestly, not drawing attention to his own glory but the Father’s. “If I glorify myself, my glory is nothing. It is my father who glorifies me” (John 8:54). If the Son of God doesn’t boast, then neither should we. Give glory to God by using your strength and abilities to provide for women. God intentionally created our bodies so we could serve women, not so we could bench press. This is why males were the ones to provide for women in the pre-historic era. One way we can practice modesty is through our clothing. If we actually put some thought into our clothing, we could send a very strong message. Imagine how loved a lady would feel if you dressed yourself in a way that said “I am saving my body for you and only you.” Actions speak louder than words, so if you truly love somebody, your body will proclaim it. After I instructed someone to wear modest swimwear, I realized how hypocritical I was being by then taking my shirt off and wanting women to notice my body and glorify me. When I started wearing a shirt when I swam, my body acted as a sign of love toward others. Eventually women had even commented that it made them feel respected. Even other guys took notice. I share this not to be pretentious but to show how powerful a small act of modesty can be. Men can make an impact on this world if we choose to live modestly and stop blaming it all on women. It is a two way street and both men and women must work in cooperation for the dignity of each other and the glory of God. This can only be done when men choose to reflect Christ’s humility towards the Church and when women reflect Mary’s desire to receive and nurture Christ. So long as men remain proud and arrogant, women will never want to receive anything from us, and they will only desire independence from men. Be a man, and serve your women modestly. That’s what Christ did. That’s what you should do. Men, Pray to Christ that you may have the strength to follow the model he gave us and die for His Church. Men, protect, defend, uplift, and serve the dignity of women. This is spot on! Y’all have a beautiful site here, thank you for your work and may Yahweh BLESS you!